Operate your traditional 3-Wire Twin-Coil switch machines with Touch Toggles. 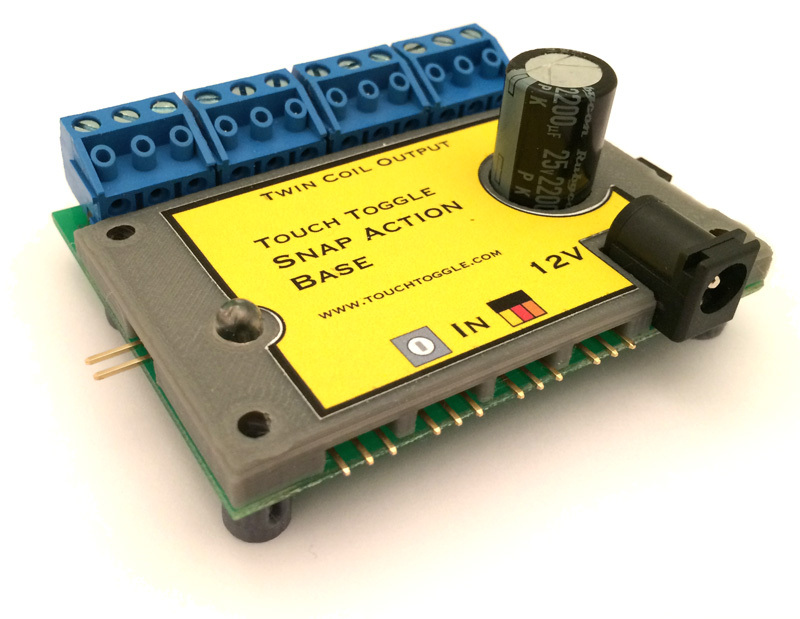 Our Snap-Action Base unit gives the Touch Toggle system the ability to control the traditional 3-wire twin-coil switches from Bachmann, Peco, and any of the N, HO, or O scale machines that operate on 12 volts. This base works with any style of our Touch Toggles. The built in precise timing and charging circuits ensure that every machine gets the full power it needs, and no machine will ever be left on to overheat. With very short activation times the output should never overpower even a small switch machine. Each Snap Action Base will control up to four 3-wire switch machines, and will daisy-chain side by side with other bases to share a common power supply. Note: Most twin-coil designs are designed for powerful 16v-18v AC supplies (which actually have a peak voltage near 24v). We offer a 24v High Voltage Power Supply that works well with Bachmann, Peco, Lifelike, Atlas-Code 100, NJ, and other pre-electronic supply engineered machines. The outputs can handle a huge surge, so they are quite sturdy against all but a direct short. That way users (like us) won’t ruin their investment or their fun by being too casual about connections. We couldn’t make the output truly short-proof and still give the Oomph needed to throw some of the more stubborn switch machines. We’re sure enough of our gear that if you promise to be careful when you connect your wires, we’ll cover the replacement of your investment the first time it fails from an accidental overload. (Note that we can’t warrantee boards against being hooked up with reversed polarity, so be careful). The Snap Action Base is approximately 2-3/4″ wide, 2-1/2″ deep, and 1-1/4″ tall. (70mm x 63mm x 32mm). Mount with four – #6 (5mm) screws. Each twin-coil machine should be connected to it’s own output for full power operation. Our Input Splitter lets you control 2 or 3 inputs from the same Touch Toggle. You can also use an Input Splitter and a Relay Base to add contacts to any turnout! Use an Input Splitter with a Direct Base to provide power for trackside signaling too. The Snap Action Base works great at voltages up to 24 volts. Older Atlas, Bachmann, and LifeLike machines need 18 to 24 volts to operate. Order our Higher Voltage Supply to deliver a bit more punch. We sell Terminal Power Adapters, so it’ll be easy enough to connect to your own power supply. Please read About Power for Touch Toggles for detailed information. Kato and other Polarized Switching is here! Two-wire polarized machines like Kato and Rapido Trains have special requirements. These machines use a similar design to the 3-wire boards, but have only two wires with reversing current. Read about them here.